The number of direct flights to Vietnam’s three main international airports – Ho Chi Minh City, Hanoi Vietnam and Da Nang, in order of importance – have increased steadily in recent years. However, the majority of visitors take the cheaper option of an indirect flight routed through Bangkok, Singapore or Hong Kong; a stay in one of these cities can be factored into your schedule, often at no extra cost. You may well save even more by taking a bargain–basement flight to Bangkok, Kuala Lumpur or Singapore, and a separate ticket through one of the region’s low–cost carriers, such as Jetstar, Tiger Airways and Air Asia, for the Vietnam leg. Airlines that fly in and out of both Hanoi and Ho Chi Minh City normally sell you an open-jaw ticket, which allows you to fly into one city and out of the other, leaving you to travel up or down the country under your own steam. Airfares always depend on the season, with the highest generally being July to August, during the Christmas and New Year holidays and around Tet, the Vietnamese New Year; fares drop during the “shoulder” season – September to mid-December – and you’ll get the best prices during the low season, January to June. You can often cut costs by going through a specialist flight agent – either a consolidator, who buys up blocks of tickets from the airlines and sells them at a discount, or a discount agent, who in addition to dealing with discounted flights may also offer special student and youth fares and a range of other travel-related services such as travel insurance, rail passes, car rentals, tours and the like. Combining Vietnam travel with other Southeast Asian countries is becoming increasingly popular – and a lot cheaper and easier – thanks to some good-value regional air deals. Jetstar (w jetstar.com), for example, flies from Singapore to Ho Chi Minh City (from $50 one-way), while Tiger Airways (w tigerairways.com) flies from Singapore to Hanoi (from $70 one-way) and Ho Chi Minh City (from $50 one-way). Air Asia (w airasia.com) offers daily services from Bangkok and Kuala Lumpur to both Hanoi and Ho Chi Minh City, with fares starting at $50 one-way to Ho Chi Minh City, and a little more to Hanoi. As with all discount airlines, prices depend on availability, so the earlier you book the better, though you may also find last-minute promotional fares, seat giveaways and so forth at less busy times of the year. There are as yet no non-stop flights to Vietnam from the UK or Ireland (believed to be starting with Vietnam Airlines in December 2011). Instead, most people fly with a Southeast Asian carrier such as Singapore Airlines (w singaporeair.com), Thai Airways (w thaiairways.com), Malaysia Airlines (w malaysiaairlines.com) or Cathay Pacific (w cathaypacific.com) from London via the airline’s home city. In recent years the big Middle Eastern airlines, Qatar (w qatarairways.com) and Emirates (w emirates.com), have also offered very competitive prices. Scheduled low-season fares from London start at around £450, rising to £600 or more at peak periods. A good place to look for the best deals is the travel sections of the weekend newspapers and in regional listings magazines. Students and under-26s can often get discounts through specialist agents such as STA (w sta.com) or USIT in Ireland (w usit.ie). Whoever you buy your ticket through, check that the agency belongs to the travel industry bodies ABTA or IATA, so that you’ll be covered if the agent goes bust before you get your ticket. In 2004 United Airlines (w united.com) became the first American carrier to resume direct flights to Vietnam since 1975. The airline operates a daily service from San Francisco to Ho Chi Minh City via Hong Kong; standard return fares start at around $1100. As yet, no other American or Canadian carriers offer direct services, which means you’ll either have to get a flight to San Francisco or catch one of the many flights to a regional hub, such as Bangkok, Singapore or Hong Kong, and continue on from there. Scheduled flights start at around $1400 from New York, $1200 from Los Angeles, CAN$2000 from Vancouver and CAN$2500 from Toronto. Note that some routings require an overnight stay in another city such as Bangkok, Taipei, Hong Kong or Seoul, and often a hotel room will be included in your fare – ask the airline and shop around since travel agents’ policies on this vary. Even when an overnight stay is not required, going to Vietnam can be a great excuse for a stopover: most airlines will allow you one free stopover in either direction. A reasonable range of flights connects Australia and New Zealand with Vietnam, with Qantas (w qantas.com), Vietnam Airlines (w vietnamairlines.com) and Jetstar offering direct services from Australia. The alternative is to fly to another Asian gateway, such as Bangkok, Kuala Lumpur, Singapore or Hong Kong, and then either get connecting flights or travel overland to Hanoi or Ho Chi Minh City. By far the cheapest flight from Australia is the daily Jetstar service to Ho Chi Minh City from Sydney (AUS$390 one-way) via Darwin (AUS$250 one-way). Both Vietnam Airlines and Qantas operate direct flights to Ho Chi Minh City from Melbourne and Sydney; low-season scheduled fares start at around AUS$1100 with Vietnam Airlines, with Qantas often a little cheaper. If you want to stop off on the way, there are good deals to Hanoi and Ho Chi Minh City with Malaysia Airlines via Kuala Lumpur, Singapore Airlines via Singapore, and Thai Airways via Bangkok, all costing around AUS$1100 to AUS$1500. Cheaper still are the fares offered by Tiger Airways, a discount airline operating daily flights between Perth and Singapore: one-way fares sometimes dip below AUS$200. From Singapore you can get an onward flight to Hanoi (from around AUS$100 one-way) or Ho Chi Minh City (from around AUS$55 one-way). From New Zealand, low-season fares with Malaysia Airlines, Thai, Qantas and Singapore Airlines are all around NZ$1500 to NZ$2200, with a change of plane in the carrier’s home airport. It’s increasingly popular to enter Vietnam overland from China, Laos or Cambodia, an option that means you can see more of the region than you would if you simply jetted in. However, it must be said that regional air connections are becoming better and better – you can fly from many cities in Southern China, from Phnom Penh or Siem Reap with Cambodia Angkor Air (bookable through codeshare partner Vietnam Airlines), or from Vientiane with Vietnam Airlines or Lao Airlines (w laoairlines.com). From China there are three overland possibilities. The Beijing–Hanoi train enters Vietnam at Dong Dang, north of Lang Son, where there’s also a road crossing known as Huu Nghi Quan. The border is also open to foot traffic at Lao Cai in the northwest and Mong Cai in the far northeast. From Laos, six border crossings are currently open to foreigners: Lao Bao, the easiest and most popular, some 80km west of Dong Ha; Cau Treo and Nam Can, to the north and northwest of Vinh; Na Meo, northwest of Thanh Hoa; Bo Y, northwest of Kon Tum; and Tay Trang, just west of Dien Bien Phu. While it’s perfectly possible – and cheaper – to use local buses to and from the borders, international bus services also run from Savannakhet and Vientiane to Hanoi, Dong Ha, Vinh, Da Nang and other destinations in Vietnam: these direct services are recommended, as regular reports of extortion continue to come in from those crossing independently. From Cambodia you can travel by air-conditioned bus ($9–14) from Phnom Penh straight through to Ho Chi Minh City, via the Moc Bai crossing. Cheaper operators charge half these prices, but use old buses and usually get you to switch at the border. Many tour companies in Phnom Penh will be able to organize boat-plus-bus services, which are a fun way to cross the border. There are two crossings in the Mekong Delta area – Vinh Xuong and Tinh Bien, which are respectively 30km north and 25km west of Chau Doc. There are also border crossings at Xa Xia, on the coast west of the delta, which is useful if you are coming from Kep or Sihanoukville on the Cambodian coast; and at Le Thanh in the central highlands, making it possible to go from Banlung in northeast Cambodia straight through to Pleiku. As long as you have a valid visa, crossing these borders is generally not a problem, though you may still find the odd Vietnamese immigration official who tries to charge a “processing fee”, typically one dollar. Most border gates are open from around 7am to 5pm and may close for an hour over lunch. If you want to cover a lot of ground in a short time in Vietnam or have a specific interest, an organized tour might be worth considering. Specialist tour operators offer packages that typically include flights, accommodation, day excursions and internal travel by plane, train or road. These are expensive compared to what you’d pay if you arranged everything independently, but the more intrepid tours often feature activities that would be difficult to set up yourself. There’s a wide variety of all-inclusive packages available, as well as organized tours that cover everything from hill-tribe visits to trekking and biking. Tours range in length from a few days to several weeks, and you can choose to explore Vietnam only, or combine a tour with Laos and Cambodia. Alternatively, you can make arrangements through local tour operators in Ho Chi Minh City, Hanoi and other tourist centres either before you arrive or on the ground; they’ll arrange your entire trip or just the first few days to get you started. Fixing it up before you arrive saves time, though all local operators will also arrange an itinerary for you on the spot. Prices will be generally cheaper with a local operator and they should have more in-depth local knowledge. However, you’ll need to check carefully that they’re financially sound, reliable and can deliver what they promise – never deal with a company that demands cash upfront or refuses to accept payment by credit card, and get references if you can. Also check carefully before booking to make sure you know exactly what’s included in the price. We’ve listed some of the bigger and better-established agents outside Vietnam; all have a solid reputation for organizing small-group and customized tours. However, there also exist a fair number of excellent Vietnam-based operators; most are based in Ho Chi Minh City and Hanoi. Abercrombie & Kent UK t 0845 618 2200, US t 1 800 554 7016, Australia t 1300 851 800; w abercrombiekent.co.uk, w abercrombiekent.com, w abercrombiekent.com.au. Luxury tour specialist; trips featuring Vietnam come as part of a greater trip through Indochina. Intrepid Travel UK t 020 3147 7777, Australia t 1300 364 512, New Zealand t 0800 600 610; w intrepidtravel.com. Affordable small-group trips, usually focusing on low-impact, cross-cultural contact. 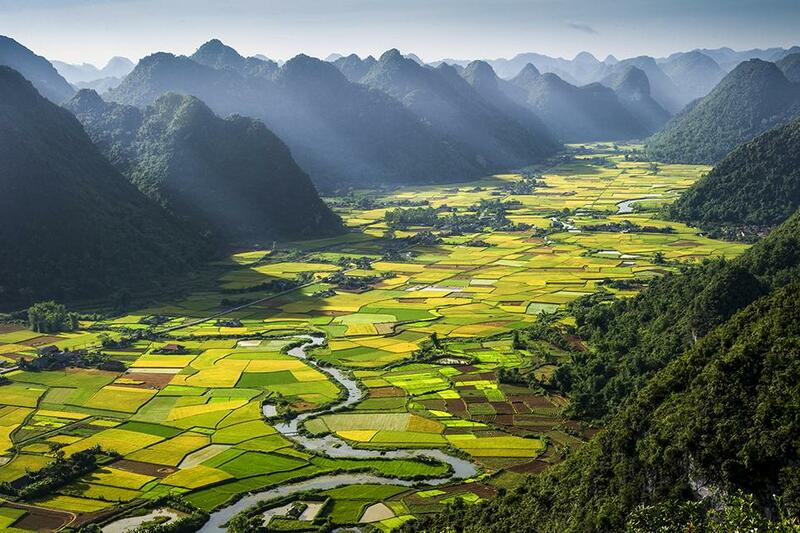 Tours can cover bits of Vietnam, the whole country or wider Indochina. Peregrine Adventures UK t 0845 004 0673, Australia t 1300 854 444; w peregrineadventures.com. Good local knowledge for an outfit that goes everywhere. Most tours are small-group and adventure-based, often with a focus on trekking, cycling or even food. World Expeditions UK t 020 8545 9030, US & Canada t 1 800 567 2216, Australia t 1300 720 000, New Zealand t 0800 350 354; w worldexpeditions.com. Adventure company with a wide variety of programmes, including cycle tours and kayaking in Ha Long Bay. Also offers community project trips, where participants help renovate a local school, for example, and arrange charity challenges. Active Travel Australia t 02 9264 1231, w activetravel.com.au. Renowned outfit with a wide range of culture and adventure tours, plus customized itineraries. Griswalds Vietnamese Vacations Australia t 02 9430 6426, w vietnamvacations.com.au. Long-running Vietnam specialists offering small-group, tailor-made itineraries. Artisans of Leisure t 1 800 214 8144, w artisansofleisure.com. Luxury private and individually tailored tours, which often include cooking classes and spa therapy sessions. Asian Pacific Adventures t 1 800 825 1680, w asianpacificadventures.com. Regional specialists offering tailor-made and small-group tours, including trekking and hill-tribe markets. Backroads t 1 800 462 2848, w backroads.com. Cycling, hiking and multi-sport tours, with the emphasis on going at your own pace. Global Exchange t 415 255 7296, w globalexchange.org. A not-for-profit human rights organization that leads educational tours of Vietnam. Journeys International t 1 800 255 8735, w journeys.travel. Prestigious, award-winning operator focusing on eco-tourism and small-group trips. VeloAsia t 1 888 681 0808, w veloasia.com. Indochina specialist with a range of organized and tailor-made cycling adventure tours. Their famed Highlights of Vietnam tour connects Hanoi and Ho Chi Minh City, and lasts twelve days. Exodus UK t 0845 287 7690, w exodus.co.uk. Adventure-tour operator taking small groups on specialist programmes that take in trekking, biking, kayaking and cultural trips. Imaginative Traveller UK t 0845 287 7053, w imaginative-traveller.com. Affordable, small-group adventure tours from a responsible travel operator. The nine-day “Northern Vietnam Escape” tour is particularly popular. Regent Holidays UK t 0845 277 3317, w regent-holidays.co.uk. Any operators that can organize good tours to North Korea will surely find Vietnam a piece of cake. Good-value, tailor-made tours available, as well as off-the-shelf itineraries a twelve-day “Highlights of Vietnam” trip. responsibletravel.com UK t 01273 600030, w responsibletravel.com. UK-based online travel agent listing pre-screened holidays from responsible tourism operators. Many airlines and discount travel websites offer you the chance to book your tickets online, cutting out the costs of agents and middlemen. The websites listed below offer good deals and useful price comparisons. ebookers UK t 020 3320 3320, Republic of Ireland t 01 431 1311; w ebookers.com, w ebookers.ie. Low fares on an extensive selection of scheduled flights and package deals. North South Travel UK t 01245 608291, w northsouthtravel.co.uk. Friendly, competitive travel agency, offering discounted fares worldwide. Profits are used to support projects in the developing world, especially the promotion of sustainable tourism. STA Travel UK t 0800 819 9339, US t 1 800 781 4040, Australia t 134 782, New Zealand t 0800 474 400, South Africa t 0861 781 781; w statravel.com. Worldwide specialists in independent travel; also student IDs, travel insurance, car rental, rail passes and more. Good discounts for students and under-26s. Trailfinders UK t 0845 054 6060, Republic of Ireland t 01 677 7888; w trailfinders.com, w trailfinders.ie. One of the best informed and most efficient agents for independent travellers.